Find out how to use Snapchat geofilters on android and iPhone. Geofilters on Snapchat is some kind of stickers or filters that represent a location or city. Geofilters is a fun way to tell your friends that you are on vacation in Paris, Hawaii or Bali. Geofilters are available in almost all major cities in the world. You can also check the geofilters map where you can see which cities already have Snapchat geofilter. Previously you need to update your Snapchat app to get all the latest features and bug fix. Go to Google Play Store or App Store to see if your Snapchat app needs to be updated. Geofilter utilizes GPS on your android or iPhone to know where you are so it can show geofilters available in the location where you are now, so you need to enable the location service. If you are using iPhone, Go to Settings –> Privacy –> Location Services, and turn on for Snapchat. If you are using android, Go to Settings –> Location –> Turn on. Next thing you need to do is enable filters on your Snapchat app. This option usually active by default, but let’s do it again just to make sure. 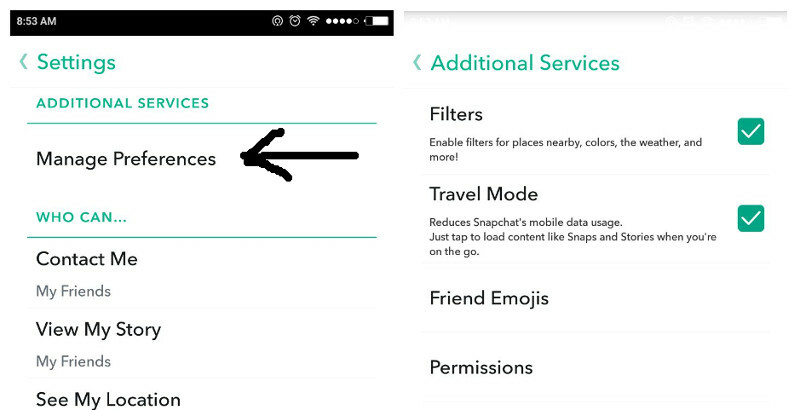 Launch your Snapchat app and go to the Settings, scroll down to Additional Services section and tap Manage Preferences. Now Snapchat already knows where you are, but they do not store your location data. To use geofilter, go to the main screen and swipe right to get a preview of geofilter available around you. You can also add stikers, doodle, and caption along with geofilters. To see which cities that already have geofilters, you can see the following maps provided by the Snapchat Geofilter community from reddit. You can’t find geofilters in your city? Do not worry, Snapchat allows their users to submit their own geofilters. You can create and submit a Community Geofilter for your city. So that’s how to use Snapchat geofilters. Now you can also show off where you are on holiday like your friends. If you are still having trouble in using Snapchat geofilters, please let us know about it.